Thank you for looking at our unit. New flat screen 55" Samsung Smart TV and complete new living room furniture includes two recliners and large plush sofa for your comfort and relaxation. 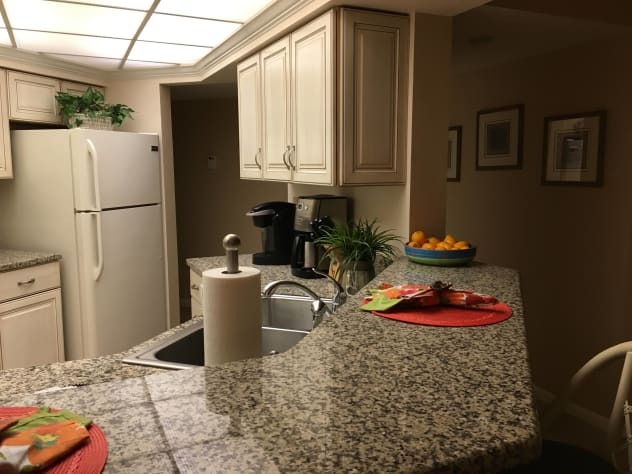 Completely remodeled kitchen,granite counters,new cabinets and a new dishwasher and remodeled baths both with new comfort height toilets and new shower with granite. 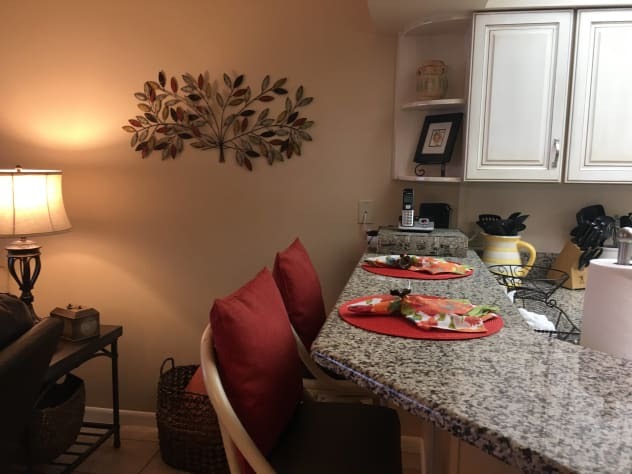 Two private baths.New Patio Furniture includes table,four chairs and chaise lounger.The Summerhouse provides one of the most relaxing, family-friendly accommodations on Panama City Beach with 24-hr security is provided. Free Wi-Fi. I also give complimentary FREE BEACH SERVICE in season March 1, to October 31, for our guests. Selection of movies, games and books available in unit for our guests. 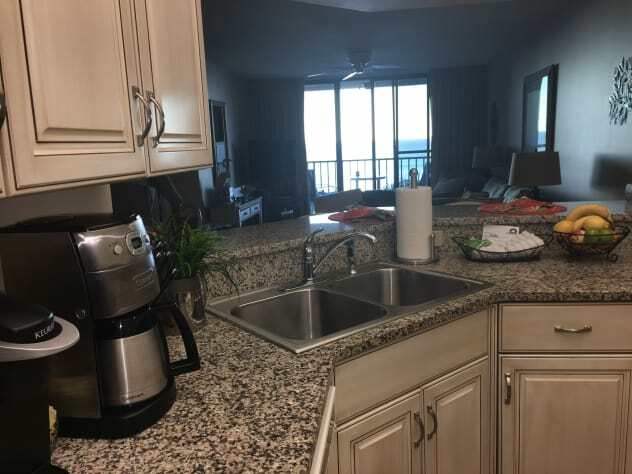 Complete view of ocean from kitchen, living-dining area and master bedroom the minute you walk through the door with access to balcony from master and living room.Very comfortable large spacious condo with luxury sheets and high thread count linens. Kitchen fully appointed and everything need to cook a great meal or scrumptious breakfast. We furnish a starter supply of shampoo,soap, paper towels, toilet paper and dishwasher soap. No pets are allowed and no smoking in unit.Keyless lock entry.No keys to fool with. 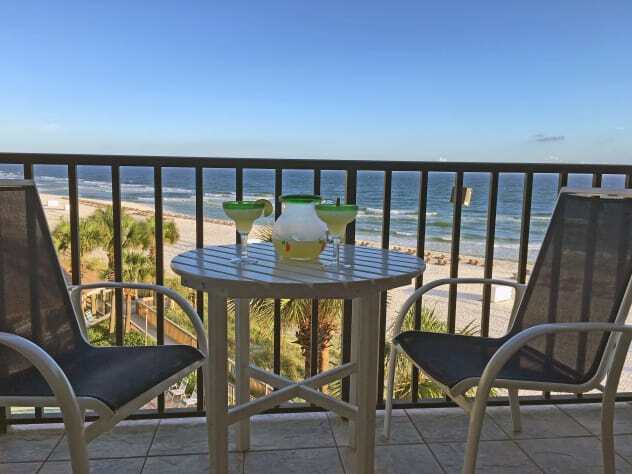 Enjoy your morning cup of coffee or evening cocktail on the balcony overlooking the beautiful remodeled courtyard with a fantastic view of the Beautiful Gulf of Mexico and it's pristine white sand beaches or an evening cocktail relaxing on the beautiful deck of the Gazebo listening to the sounds of the Gulf and enjoy the sunsets. 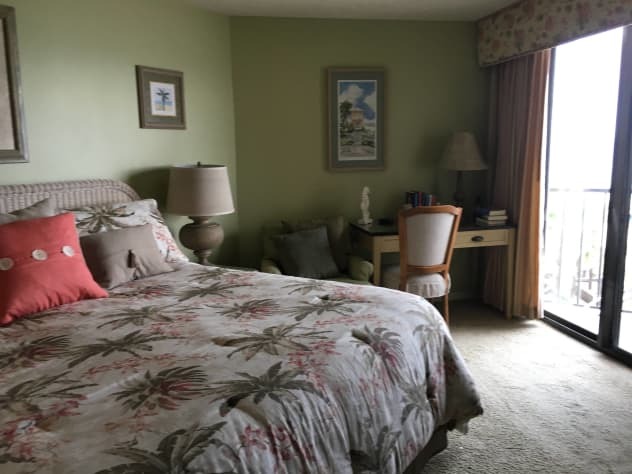 Our 4th floor, 2 BR, 2 Private Bath unit is the second unit from the ocean in “C” Building, sleeps up to 6 guests with a king bed in the master bedroom overlooking the gulf with balcony access from master bedroom. We have two new queen beds in the guest room. There are three flat screen TV's and 3 DVD players. The kitchen is fully equipped and recently remodeled,for those who enjoy cooking in, you will find it totally stocked. The kitchen has a Keurig machine for that instant cup of coffee or cup of tea and a Cuisinart thermal coffee maker for brewing coffee. Laundry Room equipped with new full size washer and dryer. 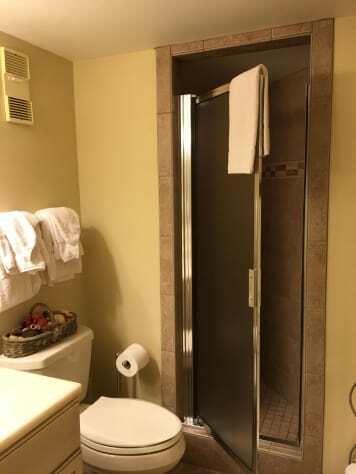 Remodeled baths include comfort height toilets and hair dryers in each bath for your convience. Master bedroom includes desk for your convenience with a great view of the beach and a full size chair for relaxing or reading. Our balcony with brand new balcony furniture overlooks 2 pools (1 heated in the winter), a hot tub, a kiddie pool, and a large beachfront gazebo. I also have beach chairs and umbrellas in the guest closet for your use. Other activities conveniently located beachfront include pontoon boat rentals, banana boat rides, parasailing and Jet Ski rentals. Charter fishing trips and golf are close by. 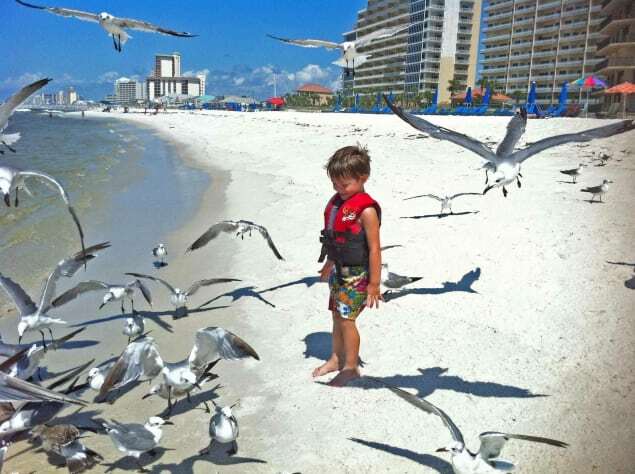 Shopping is just minutes away at wonderful Pier Park which has many restaurants and sports bars and a Movie Theater. Close to Schooner's, Sisters of the Sea, Patches and Captain's Anderson and Grand Marlin, just to mention a few great restaurants. All units at The Summerhouse are non-smoking, with smoking allowed on the balcony and no pets are allowed. The Guests must be 25 to register and children are welcome and safe on property. Also available on the property is a Lobby with arcade games and 3 pool tables with chairs, couches, and a large flat screen TV. 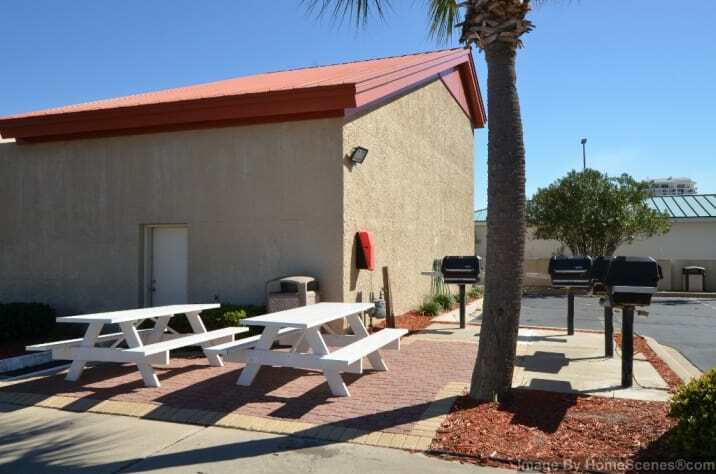 Picnic tables and outdoor grills(gas and charcoal), Tennis courts, racquetball and shuffleboard are also available on site. A large Gazebo overlooks the ocean where guest enjoys the shade, food, drinks, with friends while enjoying sunsets.We have furnished our condo for our guests pleasure and enjoyment. 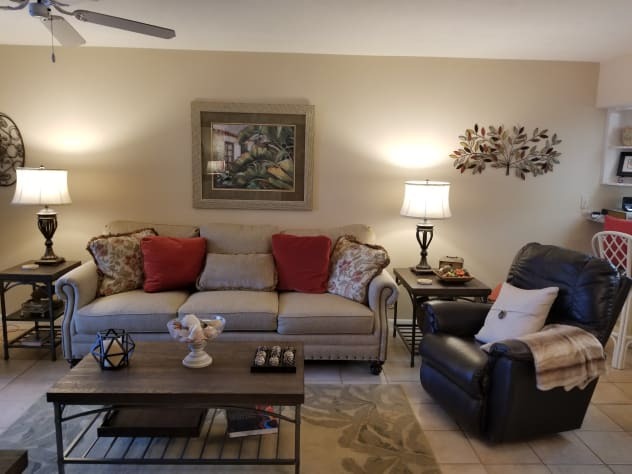 Please take time to read my reviews and see why I think you will enjoy this condo for your next vacation. I offer one free night with a seven night booking. Reservations changed or cancelled outside the cancellation policy will be charged an administration fee of $150.00. Daily or weekly reservations cancelled or changed within 30 days of arrival are subject to a cancellation fee of $250.00. Monthly reservations cancelled within 60 days prior to arrival are subject to a $300.00 cancellation fee. We stayed in Mrs. White's condo for the first time and fell in love. It was beautiful and had a great view of the ocean. Would totally recommend this condo to all my friends and family. Mrs. White was great to work with and so generous. I truly enjoyed my stay. We have stayed in Mrs. White's condo for the last several years. The condo is magnificent. It is so well stocked, comfortable and updated. The view is absolutely breathtaking. Each morning, you can sit on the balcony and listen to the waves hit the beach and just relax while watching dolphins swim along. 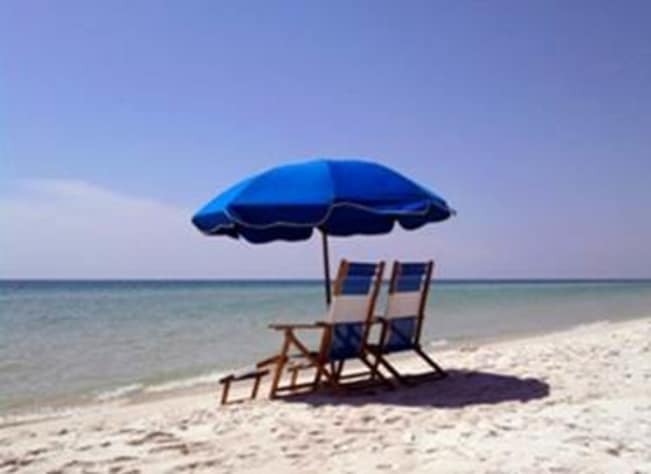 The added benefit of beach chairs and umbrella makes a trip to the beach a breeze. The pool area is lovely and this year they added umbrellas around the pool for extra shade. The entire complex is terrific. What makes this condo extra special is the owner! I can't say enough about the care Mrs. White puts into her condo - it shows in all the details and she makes the rental process so easy. 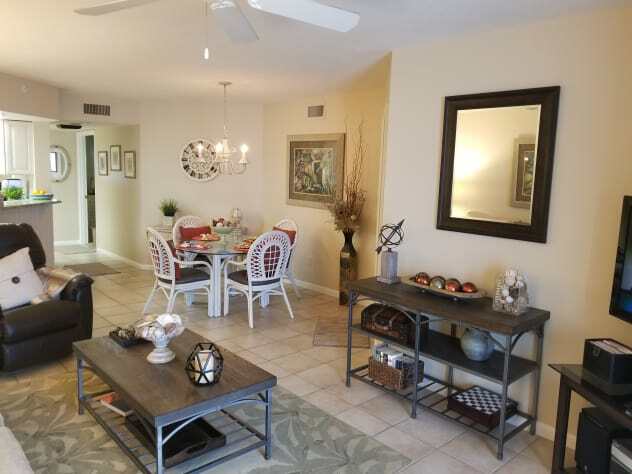 This is a perfect condo for families or just adults who want to get away. This is the BEST condo in PCB! Totally Fantastic, Elaine is a Super Lady to Work with!! The condo is extremely nice, with great furnishings!! 4th floor has Fantastic view of the beach!! Highly Recommend!! We had the best time! Beautiful condo and view! We can’t wait to return! The beds are so comfortable and we didn’t want to leave. Thank you so much! Working with you guys was so easy! So glad you all had a great vacation and can't wait for your return. You were a pleasure to rent to. This was our second time staying at Elaine's immaculate condo. We LOVED every moment. From the sunsets, to the sunrises, and the late evening beach views it was PERFECT. If you are looking for a place to stay, where all you need to do is RELAX this is it!!!!! Thanks again for opening up your place for us to enjoy. We will DEFINITELY be back for years to come. My husband and I along with my daughter and son-in-law stayed in this condo in late May 2018. The condo was beautiful and everything was perfect for our stay. We got to experience Tropical Storm Alberto coming ashore during our stay but even with a few rainy days it was still a great vacation. This condo has everything you need for a pleasant stay and the grounds at the Summerhouse are always beautiful. I have stayed in quite a few condo's over the years in PCB and the Summerhouse is my favorite. 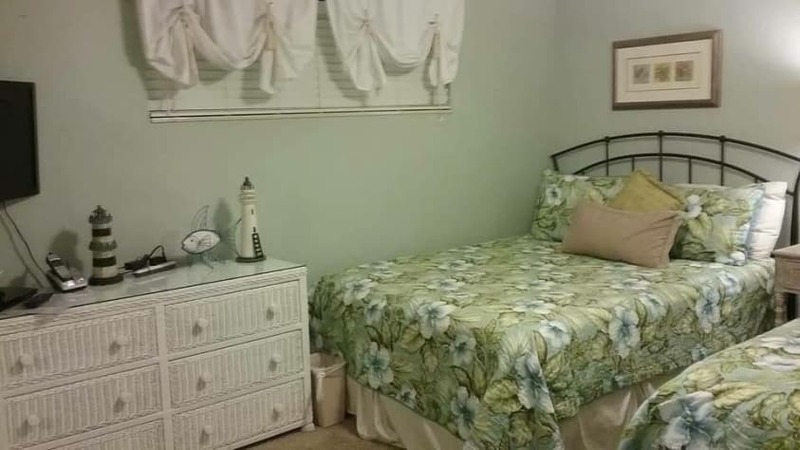 It is large enough to have nice amenities but not too big and not crowded. You don't have to wait forever on an elevator or walk a long distance to get to your car. The owner of this condo is so easy to work with and made sure that everything was perfect for us! I can't wait to visit again!! This condo is by far the nicest one we have stayed in. We usually come twice a year and hope to use this condo again. We left things behind and the owner was so gracious as to send them to us. Thank you again. We had the best time staying at Summerhouse!! Best condo we have ever stayed in and so so clean it was spotless. This condo has everything you could ask for and the view is absolutely beautiful. The pools, hot tub and huge gazebo were amazing! We spent a lot of time in the gazebo bc it’s right on the beach. The owner is so kind and accommodating. 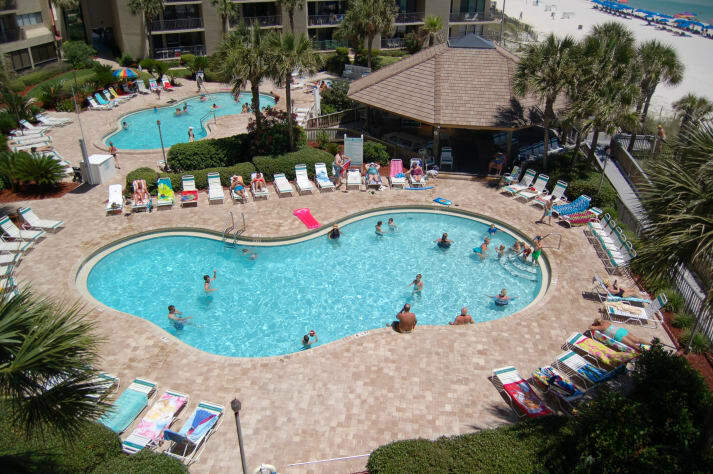 This is the only place for us to stay in PCB. This condo is the nicest and most well appointed I have ever seen. The grounds and pool area are immaculate as well with easy access to the beautiful beach. The owner is great to work with and very accommodating. 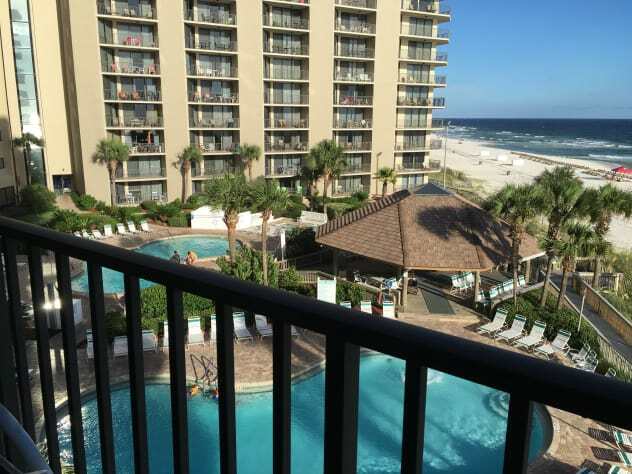 Great communication, awesome condo, wonderful pool area, and perfect beach....it doesn't get any better than this. I cannot wait for a return visit. My family and I had a wonderful stay in your home. The condo was well furnished, beds were extremely comfortable and there was plenty of room for us to spread out. The view is just amazing and Summerhouse was better than I imagined. The owners are so great to work with. One morning of our stay, we were awakened by a loud thunderstorm and the power was out in certain parts of the condo. I couldn't imagine what had happened and called Elaine thinking there was an electrical problem. She immediately answered my call, phoned the front desk and was back to me within minutes notifying me that it was building wide and that the power we still had was from a generator. Yes, I felt silly for calling her, but she was so sweet and accommodating. The beach was amazing and not crowded at all. Elaine not only provided beach service, but also provided extra beach chairs and umbrellas for our use. I would highly recommend this condo. You won't regret booking this these precious people. One of the best places I have ever stayed in at the beach! Had everything we needed and more! Highly recommend! The Condo was immaculate, and well equipped, even had a Keurig! Easy access to the stairs, which we prefer to use, right at the room. Kitchen had everything we needed. We were allowed to check in early and really enjoyed the beach chairs that were provided for us!! The office staff is great as well! Enjoyed the balcony and the view. Beautiful. We would spend our vacation here again. We stay at the Summerhouse Room #414C every summer. It has become our favorite vacation destination. The condo is so nicely decorated and comfortable. We love eating on the balcony and enjoying the view. I have recommended to all of my friends and family. We love coming down and look forward to it every year! We love staying in your lovely condo. It is very comfortable and spacious. Everything was well stocked and felt homey. The decor is very nice and everything is new and updated. The view is beautiful and the water was gorgeous. 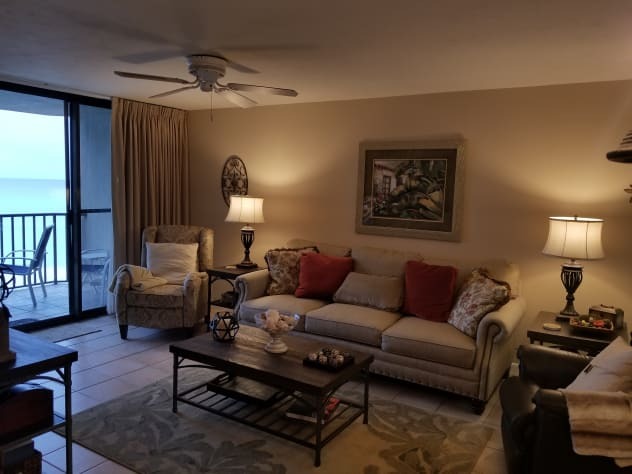 We have stayed in multiple condos on the beach and yours is by far the best value for the money and we intend on booking with you moving forward and we have told all of our friends and family to book condo 414C! Thank you for making our family vacation one to remember! I can't say enough about this place. Our unit was very clean and updated and the view was amazing. The staff is very friendly and helpful. And any questions I had about our unit was quickly answered by the owner. Our kids loved all sleeping in the same room with their own TV. We felt completely at home during our stay. 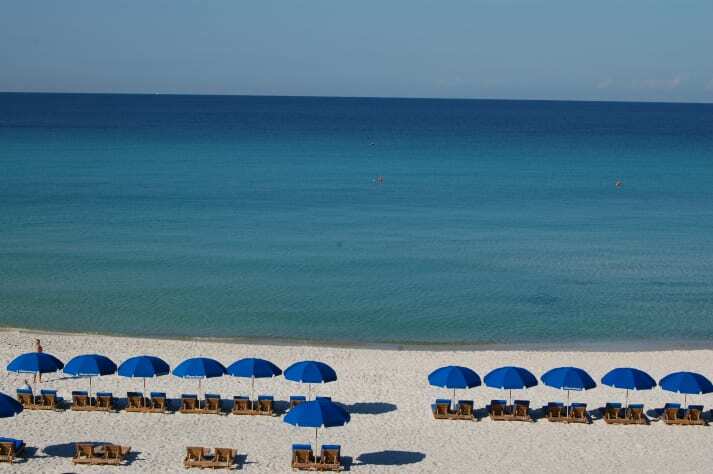 Plus it's on the quiet end of PCB and is perfect for families or for a quiet relaxing vacation. We will be back again next chance we get. My girlfriends and I could not have asked for a better condo. It had everything we needed and more. The views were spectacular and the weather great. The sunsets were amazing and we loved the beach chairs which were reserved for us and free.What a beautifully furnished condo and I can say we will come back for another stay soon. Thanks to you for sharing your condo. 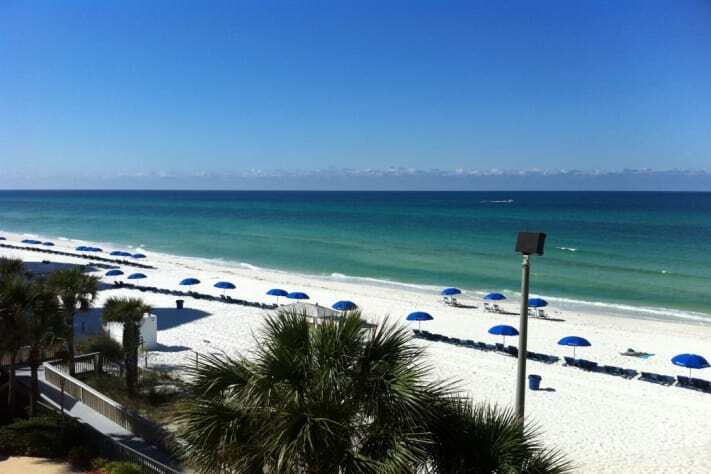 We have stayed in many condos on PCB, most much newer than Summerhouse. None of them were cleaner or better maintained. The building and grounds are immaculate for a property of its age. Your condo was spotless. I could not find a single flaw. It was also the best equipped we have ever rented. Dishes, utensils and cookware were all plentiful and in good condition. We could not have asked for better accommadations. My elderly parents were with us and the guest room was perfect for them with the seperate beds and step in shower. They were very impressed as it was their first stay in a condo on the beach. They loved the balcony in the afternoon shade with the beautiful view and the sounds of the gulf. The beach and pool were easily accessable for them. We could not have had a better time. Thank you for making your condo available to us. We will be back if we have the need for a two bedroom again. My family and I had such a magnificent stay and will return for sure!!! The condo was ready early when we arrived and the staff allowed us to check in a little early. The staff is extremely helpful and kind. The owners are very prompt in responding and have left very little undone when it comes to this condo. 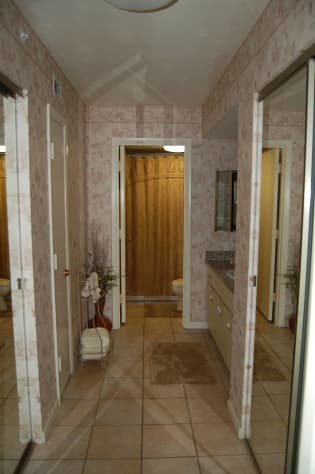 The property is very well maintained and safe. I was so surprised with all of the kitchen supplies! I normally bring a few things with me that most kitchens don't have standard but I packed mine away after we arrived and saw how well equipped it was!! The pots and pans are of high quality as are the knives and coffee maker. There is even a Keurig! The only thing I noticed the kitchen didn't have was a set of tongs which was NO BIG DEAL. The view is lovely from both the living room and the master bedroom. There are books, movies, beach umbrella, and boogie board available to use as well as complimentary beach service for 2! 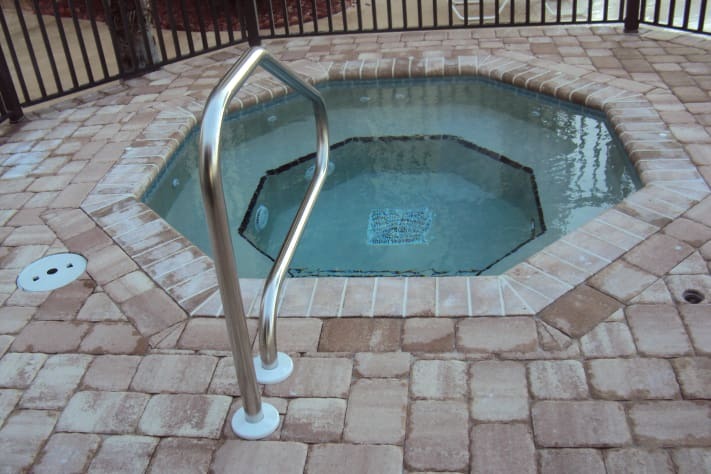 The 2 pools were very nice and one is heated. The beach area was clean and the attendants were helpful. We have not one complaint about our stay!! Before the end of the first day we were already saying we will definitely book again. We would have actually booked already but waiting to hear back from friends about going with us next October. Can't wait to go back! 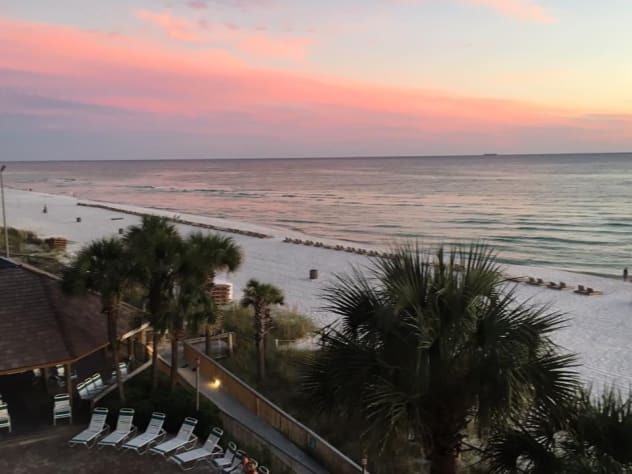 Thanks for sharing your lovely beach home with us! We really enjoyed our recent stay at the Summerhouse and your unit (9/5 - 9/17). Thank you for such a lovely property. 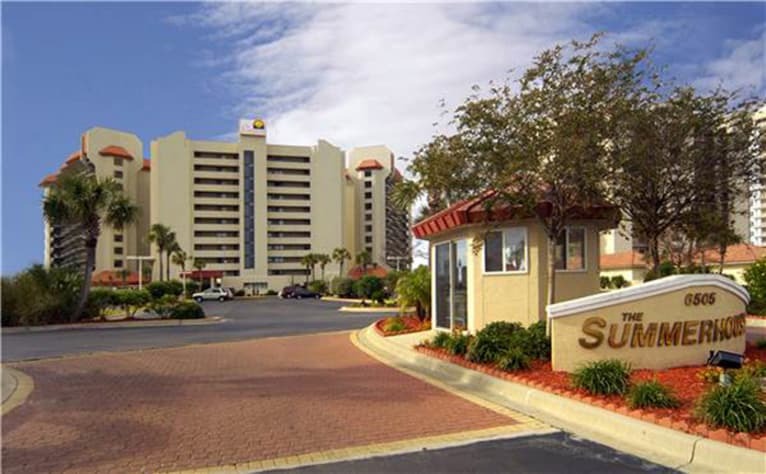 We have stayed in PCB the last 17 years and many times at the Summerhouse and this is by far one of the BEST units we have visited. The kitchen is so well stocked. I actually think there may be more gadgets in your unit than I have in my own kitchen! The master bed is very comfortable. And, I loved you have a few terrific beach reads available for your guests. My husband loved the movie selection and the TVs although with the awesome weather, TV watching wasn't high on our list of activities. The unit is decorated beautifully. The 2nd bedroom is awesome. I absolutely love the quilt bedding. This is a perfect unit for us and we look forward to renting from you in 2017 and years to come. Again, this unit is fantastic! Had a wonderful time at your condo. Great view and well furnished. The staff at Summerhouse are also top notch. Condo was clean and neat when we arrived. The experience exceeded all our expectations. My family has stayed at the Summerhouse for many years but this was the first time to rent from owner. This condo completely exceeded my expectations. It had several upgrades and the furnishings were very nice. The kitchen was upgraded and very well stocked (even had a Keurig). Living area was great with a very nice recliner! Bedrooms and bathrooms were also great! The balcony had enough chairs/table and even a lounge chair. The washer/dryer was the best I have ever used in a condo. I didn't even mind doing a little laundry while on vacation! The chairs provided on the beach was just an added bonus on top of everything. The owner was very responsive to my inquires and was very nice and easy to work with. The condo helped make our vacation just perfect and I would definitely stay in this unit again!!! Beach trip 2017 was great your condo was perfect thanks so much for allowing us to stay there. I will definitely keep you in my contacts for future trips. 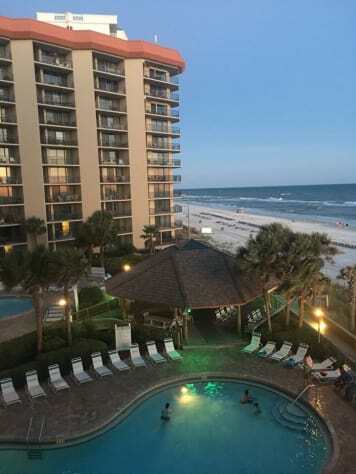 We were in PCB for a dance competition for my daughter and there were about 20 families staying at Summerhouse in different condos. Ours was by far the nicest! We felt right at home and were so thankful to be staying in such a beautiful place. We were there during Tropical Storm Cindy and so we spent more time indoors than we planned. Having such a lovely place to stay made braving the storm that much easier. I would highly recommend this unit to anyone coming to the PCB area! 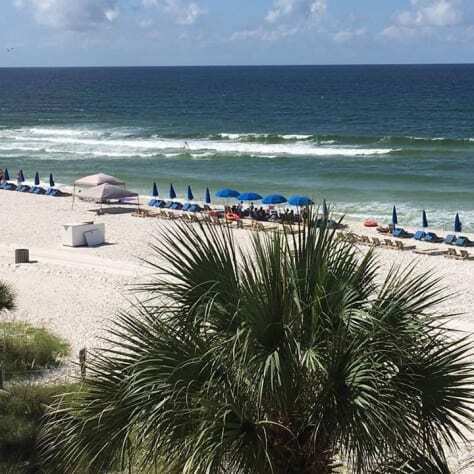 Adam M. said... Jun 4, 2017 It is super nice and would stay again at anytime.6505 Thomas Dr, Panama City Beach, FL, 32408, United States Date of Stay May 30, 2017 Helpful votes: 0/0 Very beautiful, elevators super fast, clean, beautiful views, clean pools, everything was perfect!! Ms Elaine Condo was everything you could hope for and more!! The views of the ocean from the balcony were breathtaking, Being able to just wake up and look out and see the ocean was Awesome!! Everything you need for preparing your own meals she provided in the kitchen area!! The short walk to the 2 pools and down to the beach is also Awesome!! Ms. Elaine was a Gem to work with, Anything, anytime her response was right back & helpful!! Would recommend her Condo highly!! Lord willing we will be back Next Year ????? ?